Laurent Lichtenstein, uploaded this teaser trailer for an upcoming French travel show he's directing. In this teaser trailer titled "Mission Hawaii", Laurent, mostly filmed it with the CAME-Single and BMPCC Camera plus a Kowa Prominar 8.5mm lens. The CAME-Single is extremely portable and can easily be brought with you on location to different shoots. The CAME-Single comes with a custom hard flight case that has foam cut outs inside for the handgrip and frame. The quick release camera plate system makes it easier for you to precisely balance your camera setup or to do some fine-tuning when you're out on a shoot. With the new internal battery design combined with the encoders, the battery life can roughly last 20 hours. Posted in Blog, CAME-Single. 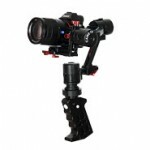 Tags: 3-axis, 3-axis gimbal, 3axis, 8.5mm, 8.5mm lens, basecam, bmpcc, came gimbal, came-single, came-tv, came-tv gimbal, cametv, encoders, gimbal, kowa, Kowa Prominar, Kowa Prominar 8.5mm, portable gimbal, single, tool-less gimbal on March 16, 2016 by vision.